What: Shares of Pandora (NYSE:P) rose nearly 12% in April, according to S&P Capital IQ data, as a successful funding round from competitor of investors ignored shrugged off an active listener decrease and reacted positively to better-than-expected revenue, engagement, and a narrower loss than expected during the company's first-quarter earnings report. So what: Pandora performed better than expected in its first quarter on both a revenue and EPS standpoint. In revenue, the company reported $230.8 million, an increase of 19% on a year-over-year basis. The company also exceeded analyst's top-line estimates of $224.6 million. And although the company recorded an EPS loss of $0.12 per share (non-GAAP), this was better than expected as consensus was a loss of $0.16 per share. Looking beyond the headline numbers, however, and the results look even better. First, user engagement reached an all-time high of 22.3 hours per active user as a testament to the popularity of the service among its heavy users, although that metric comes with a caveat -- the total number of active users dropped on a sequential basis, dropping from 81.5 million last quarter to 79.2 million this quarter. Perhaps the best metric for Pandora was its subscription-based revenue increase of $52 million, up 32% year over year. 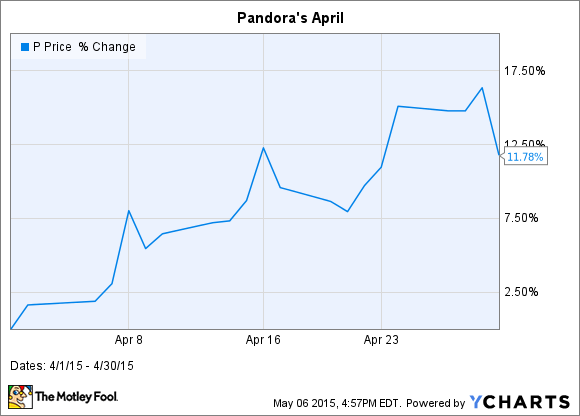 Now what: Even including Pandora's strong April, the company is still down nearly 30% on a year-over-year basis. Overall, the streaming-music space continues to become more crowded, with streaming-only companies Spotify, iHeart Radio, and now Jay-Z's Tidal. In addition, you have major tech companies with offerings -- Apple with both iTunes Radio and Beats' streaming services, Google with its Google Play Music offering, and Amazon.com now with its Amazon Prime Music streaming offering. So although it's been a tough year for Pandora investors, and competition is only going to get tougher, the company does have a dedicated user base of nearly 80 million active users. If the company continues to grow subscription-based revenue by continuing to turn active users into paying subscribers, the company could have the last laugh.